In the decades before World War One, the Orthodox Russian presence on Mont Athos grew considerably and there were probably more Russian than Greek monks there by the end of the period. Things changed once Greece took control of Athos from Ottoman Turkey in 1912 - 1913 and as Russia itself descended into Civil War. The Orthodox Russian community was centred on the Andreevski Sikt / Sekte - basically a monastery but technically not eligible for that title. There was an Ottoman post office on Athos and from the 1890's a ROPIT post office. Mail from Russia to Athos seems always to have been routed via Odessa and this fact is explicit on nearly all the mail one sees. After that, mail was sent by sea to Constantinople and then by land to Athos. Despite the fact that Athos was clearly part of Ottoman Turkey there seems to have been some confusion about mail franking with correspondents using Russian internal tariffs and then getting charged Postage Due - or not. 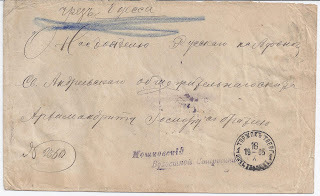 This is an ordinary letter which started out in Tver guberniya in a small community which today appears to be written in English as MOSHKI. It is located due south of TORZHOK, a larger town. Anyway, in addition to his free frank seal, the Starshina applied a violet cachet on the front which simply says MOSHKI VOLOST STARSHINA to the left of which is the essential Registry number always written bottom left to complete the claim to Free Frank Privilege. 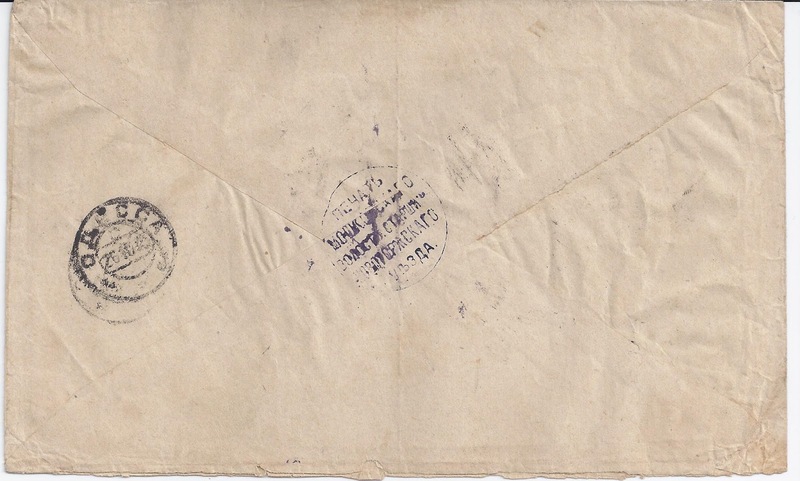 The Starshina may have had a postman or courier to take his letter to Torzhok or maybe he went to the Imperial post office himself. On this the cover is silent. 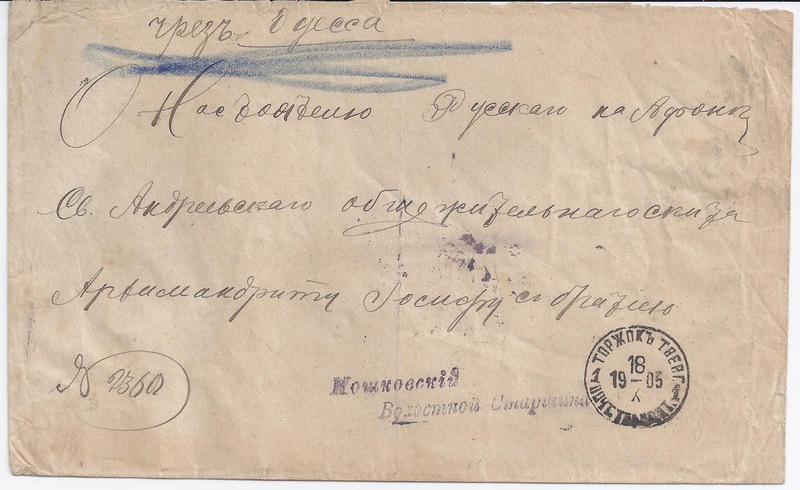 But from Torzhok the cover did indeed make it to Odessa on 26 October 1905, just over a week after despatch from Torzhok. It is addressed to the Andreevski Sikt and I am sure did get there since the cover is in an accumulation of Athos material.